Waverly’s Cody Remington scored 10 points in Friday’s 75-50 win at Valley in Southern Ohio Conference action. 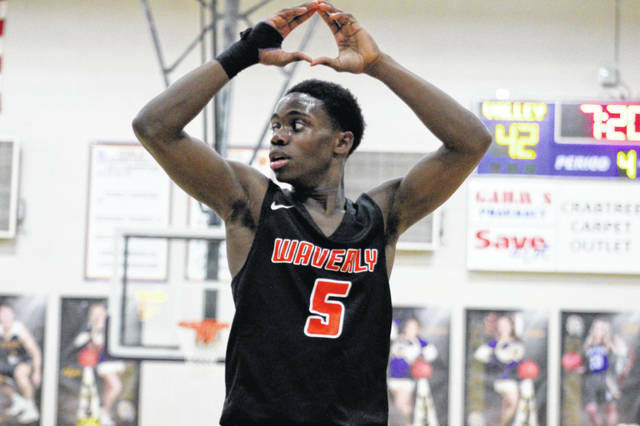 Waverly’s Trey Robertson scored a game-high 16 points in Friday’s 75-50 win over Valley. Valley’s Andrew Shope competes with Waverly’s Cobe Marquez for a rebound during the second quarter of Friday’s contest at Lucasville. The Tigers beat the Indians 75-50. 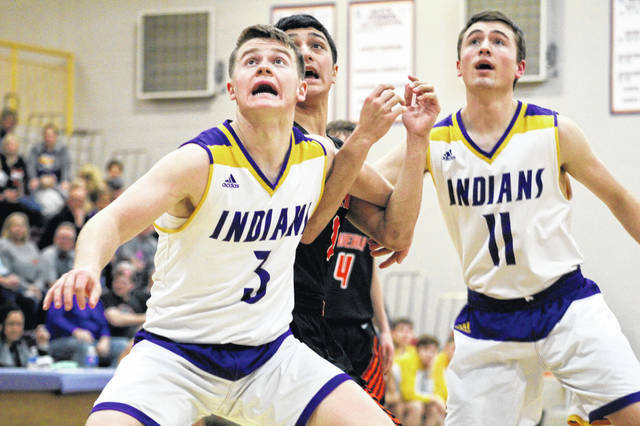 LUCASVILLE — Without even knowing it, Waverly’s Trey Robertson and Cody Remington completely changed the narrative of Friday’s game at Valley in the span of one minute and fifty-five seconds. With their Tigers leading 37-34 with 5:23 left in the third quarter, Robertson dialed long distance to extend the lead to 40-34. After a stop on the other end, he followed his first with a second, making it 43-34. Waverly’s defense forced a turnover and Cobe Marquez found Remington wide open in the corner for a third consecutive 3, capping a 9-0 run. From that point on, the Tigers (11-5, 9-2 SOC II) kept their foot on the gas pedal and sped away from the Indians (5-11, 3-8 SOC II) in an impressive 75-50 victory on the road. 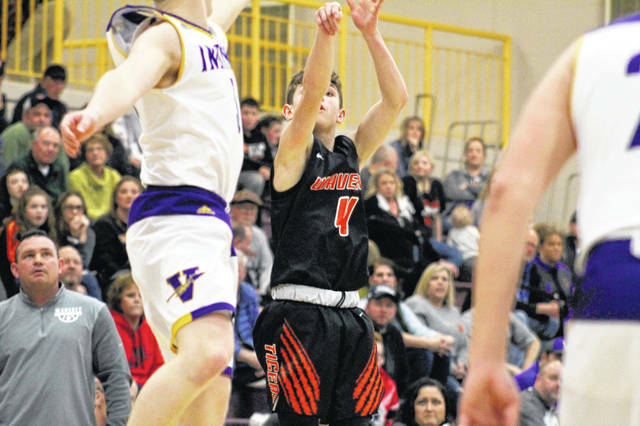 The Tigers held Tanner Cunningham and Andrew Shope, Valley’s top two scoring options, to a combined 15 points while the Indians, as a team, shot just 19-of-44 shooting. Roberston scored a game-high 16 points while hitting four 3-point field goals. His second half performance was nothing but exceptional as he took care of the basketball and knocked down shot after shot. All in all, Waverly had four players reach double-digit scoring figures while causing 14 turnovers on the defensive end. Valley’s Tyler Mitchell got the night’s scoring started with 6:55 left in the first quarter before Waverly’s Cobe Marquez answered with a 3-ball at the 6:44 mark. Marquez’s deep ball gave the Tigers their first lead of the night … and they never looked back. With 6.1 seconds left in the first, Marquez hit another 3 to extend Waverly’s lead to 21-13 heading into the second. The Indians fought back, cutting the lead to 31-28 late in the first half but Waverly’s Easton Wolf hit a buzzer-beater, putting the Tigers up 33-28 at the break. In the first half, Marquez scored 10 of his 14 points, acting as the early spark the Tigers needed. After the break, Waverly turned the heat up. After Mason Zaler brought Valley to within three points at 37-34, Robertson hit back-to-back 3’s before Remington added a third. With 3:28 left in the third, the Tigers … all of the sudden … had a 46-34 advantage. They never looked back en route to a 25-point conference win. Robertson led all scorers with 16 points while Marquez ended the night with 14 points and a game-high six assists. Wolf added 11 points and six boards, Remington finished with 10 points, four rebounds and two assists, and Haydn’ Shanks scored eight points. Mitchell led Valley with 14 points and eight rebounds while Shope added 10 points and five assists. Mason Zaler also chipped in, scoring nine points and grabbing eight boards. While Valley attempts to bounce back Saturday at North Adams, Waverly will host Miami Trace. Waverly: 28-42 FG, 12-19 FT, 7-15 3pt., 20 rebounds (Wolf 6), 8 turnovers, 16 assists (Marquez 6). Scoring: Robertson 16, Marquez 14, Wolf 11, Remington 10, Smallwood 8, Shanks 8, Dunn 4, Hoover 2, Brown 2. Valley: 19-44 FG, 7-10 FT, 5-12 3pt., 23 rebounds (Zaler 8), 14 turnovers, 15 assists (Shope 5). Scoring: Mitchell 14, Shope 10, Zaler 9, Mollette 8, Cunningham 5, Fell 4.